“Go, go, go Joseph, you know what they say,/ go, go, go Joseph, you’ll make it someday!”, goes the insistent Tim Rice lyric to the first musical hit that he and Andrew Lloyd Webber penned together – and it’s still going stronger than ever today. Joseph and the Amazing Technicolor Dreamcoat premiered as a brief cantata at a London school in 1968. Those humble origins are still honoured to this day with an onstage 20-strong children’s choir populating the steps of Sean Cavanagh’s simple, effective set. Joseph has, over the years, also undergone an inflated expansion that saw it (over) produced by Lloyd Webber’s Really Useful Company at the London Palladium back in 1991 with Jason Donovan in the title role. It was then revived for a production in 2007 with Joseph chosen by public vote after a reality TV contest that saw Lee Mead emerge a star. 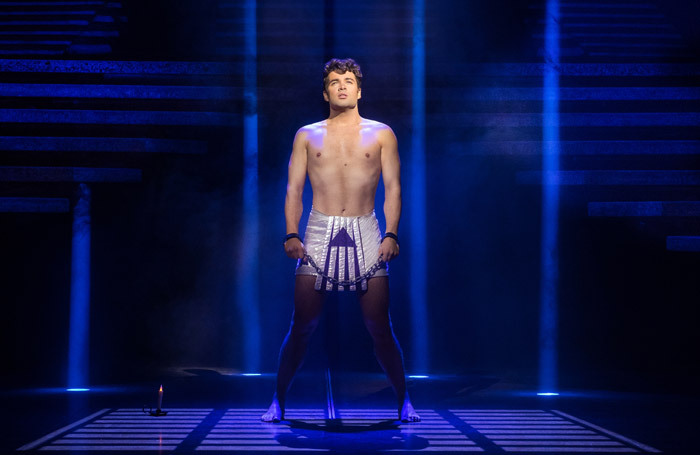 Now another reality TV star Joe McElderry – who has won three separate competitions, from The X Factor and Popstar to Operastar as well as ski show The Jump – follows Mead, and he may just be the best sung Joseph there’s ever been, bringing a vocal flair to Joseph that’s utterly ravishing. Bill Kenwright’s production – the longest-running touring show in history, now in its 36th unstoppable year – remains an irrepressible delight. And the key to it is its freshness, naivety and sincerity, as opposed to the deadening hand of knowingness that permeated its recent West End incarnations. It capitalises on the thrilling eclecticism of Lloyd Webber’s score, embracing syrupy pop ballads (Close Every Door) to French flavoured chanson (Those Canaan Days), calypso (Benjamin Calypso), and Elvis Presley rock ‘n’ roll (Song of the King). While it’s true that Henry Metcalfe’s choreography is a bit naff, its also part of the unpretentious charms of a production that is performed with zip, polish and infectious good spirits.